Wedding day is the time when family and friends gather together to toast to the happy union of two lovebirds and is also the time worth memorizing most between the newlyweds. And to make a wedding slideshow is the best way for many newlywed couples to combine photos and music for a pleasant trip down memory lane. But how to make a slideshow for a wedding? Still ask photography studios for help to conjure up the slideshow for your wedding? Actually, making a magnificent wedding video with photos and music yourself and create precious keepsakes for your wedding are now easier than you would ever believe as long as you have photo slideshow creating software. To do this, you can count on MacX Video Converter Pro. Embedded with a photo slideshow maker, this tool is your one-stop shop for stunning wedding video slideshows full of photos from the rehearsal dinner, ceremony, reception, and honeymoon. A variety of features typically translates into a flexible application that allows you to do more with your photo slideshows. You provide the wedding photos, pick the song, and the wedding slideshow maker adds the magic, plugging music in the video slideshow, converting it into a format like MP4, MOV, FLV, AVI, WMV, MKV, etc, and shepherding you to share your final wedding-themed photo slideshow on YouTube, Facebook or watch on iPhone (iPhone 6/Plus included), iPad (iPad Air 2 included), Android. 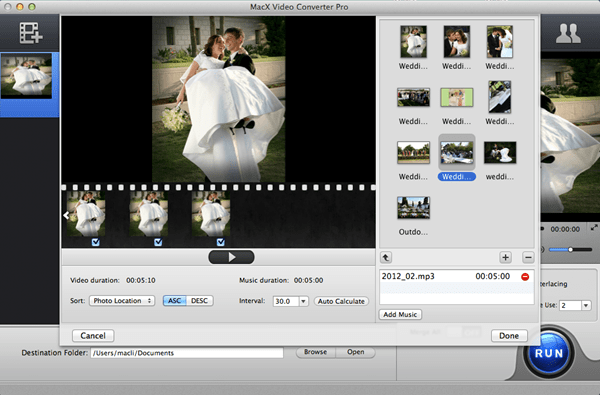 Below is the detailed guide on how to make a wedding slideshow with music on both Mac and Windows. This photo slideshow maker helps to convert a series of wedding pictures into a stunning video slideshow in FLV, MOV, MP4, AVI, etc for playback on iPhone, iPad, Android, etc. So from the drop-down box, selecting the output format is all at your fingertips. Hit the "Edit" button on the main interface, click "Add Music" to add the audio tracks from the list to the wedding slideshow as background music. You are also allowed to add or delete images, set the order of appearance according to photo location, creation date or file name. And then click "RUN" button to start to make a wedding slideshow with music you like. 1. The video montage is suggested to be between 8 and 12 minutes in length, generally including 3 songs and 75-100 pictures. If you want to display more photos during your slideshow, make sure don't subject your guests to an extremely long slideshow. 2. Choose high-quality wedding photos that look great printed as they will look great while scanned. 3. Pick up the songs that can set the general mood and tone for your wedding. If you are wishing to make a photo slideshow like wedding ceremony for uploading to YouTube, don't worry, this guide shares two ways to turn various photos into a video slideshow with music for YouTube uploading. The guide shares a No.1 photo slideshow maker specially designed for Mac users to convert a myriad of pictures into a stunning video slideshow on Mac easily, so that you can share the photo slideshow on YouTube, Facebook, iPhone, iPad, etc.